Several of the ads that I'll be exploring in this series are from General Electric and their advertisements. They are interesting in that they usually have some powerful or intriguing imagery such as this one wherein you see a drawing of the U.S.S. Constitution and the U.S.S. New Mexico next to each other--one a hallmark of the Revolutionary War and the other, a representative of World War I. 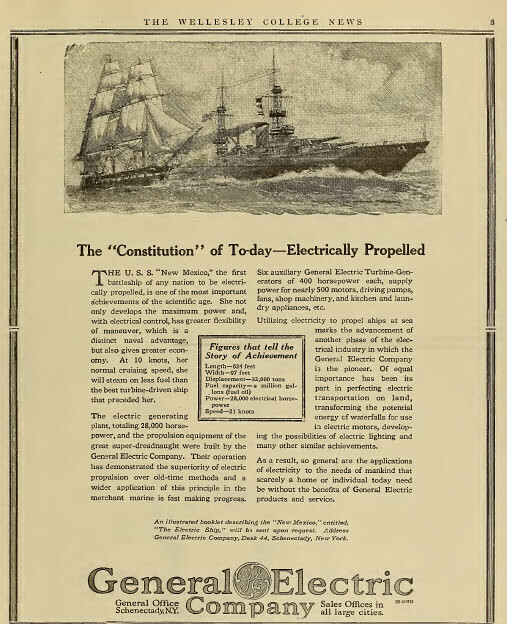 Beyond the image is usually a story like this one that connects the work of General Electric in war and at home, giving the reader a sense of power about General Electric and their products. These were typically 3/4 or 4/5 page ads meant to draw attention and even pass as part of the newspaper.